Anant Chaturthi or Anant Chaturdashi is the last day of the “Ganesh festival” celebrated in Maharashtra, Gujarat, Karnataka and Andhra Pradesh. It is the eleventh day after Ganesh Chaturthi which falls on the 14th day of the bright Bhadrapada (the sixth month of Hindu calendar). The day follows the immersion of the idols of the beloved Lord but to be welcomed the next year with equal fervor. Some people observe a vow in honour of Lord Vishnu, which if kept for 14 years is supposed to bring wealth. Mythology tells that, there was a Brahmin named Sumant. From his wife Diksha he had a daughter named Sushila. After the death of Diksha, Sumant married Karkash who was not caring to Sushila. She gave a lot of trouble to her. Sushila married to Kaundinya and decided to leave the house to avoid the nuisance of her step mother. On the way, Kaundinya went to a river to take bath and Sushila joined a women group who were worshiping “Anant”. Sushila was very curious to know the reason of worshiping. The women explained her, the purpose of this vow to obtain divinity and wealth, and are kept for 14 years. Sushila decided to take the “Anant Vow” and slowly they became very rich. One day Kaundinya, noticed a string (Anant string) on Sushila’s left hand. This string is usually tied on the left hand by women to observe the vow. When Kaundinya heard the story of the Anant vow, he was displeased and said that they had become rich, not for Anant but for his knowledge and efforts. He then took the Anant String from Sushila’s hand and threw it into the fire. Soon after this incident, they were reduced to extreme poverty. Kaundinya realized the effect of the Anant and hence decided to undergo rigorous penance until the appearance of the God himself. He went into the forest. There, he saw tree full of mangoes but was covered with worms. He asked the tree if he had seen Anant but he got a negative reply. Then he asked lakes, cow, donkey, elephant but nobody could respond him positively. At last he prepared a rope to hang himself. But suddenly Anant appeared in the form of an old Brahmin and advised Kaundinya that if he made the 14 years vow, he would get back all his wealth and happiness. Lord Anant also explained the incidents occurred during the course of his way to meet him. 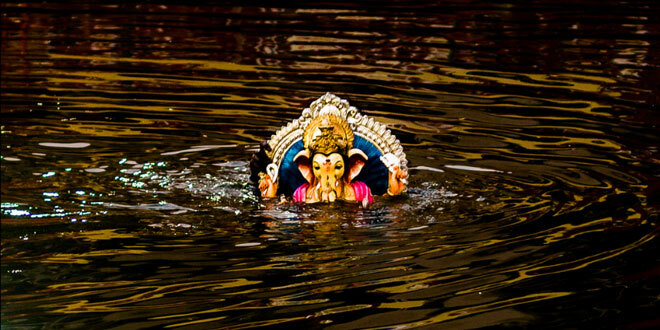 On the day of Anant Chaturdashi, the idols of Lord Ganesha installed at home and various “Mandapas” are taken to a pond, lake, river or a sea in great procession with slogan: “Ganpati bappa morya, agle baras to jaldi aa” (“father Ganpati, come again next year”). On this day, people travel to the water front with the idols, big and small, dancing and singing in large procession. The 10 day long festival comes to an end after the immersion ceremony is over.